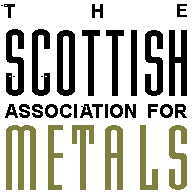 The Scottish Association for Metals is an affiliate society of the Institute of Materials, Minerals and Mining and provides learned and professional development activities to both members and non-members of the Institute. There are two other affiliate societies of the Institute of Materials Minerals and Mining in Scotland, each meeting the specialist needs and interests of members of the Institute. The Scottish Plastics and Rubber Association supports the manufacture, processing and application of polymers. The Mining Institute of Scotland has interests in mining, petroleum engineering and geotechnical engineering. The Association is a member of the EngineeringScotland. A full programme of meetings organised by professional engineering and technology institutions in Central Scotland is provided on its web site. SAM is proud to be associated with the work of the University of Strathclyde Tribology Research Group and has sponsored research students to attend a number of conferences.